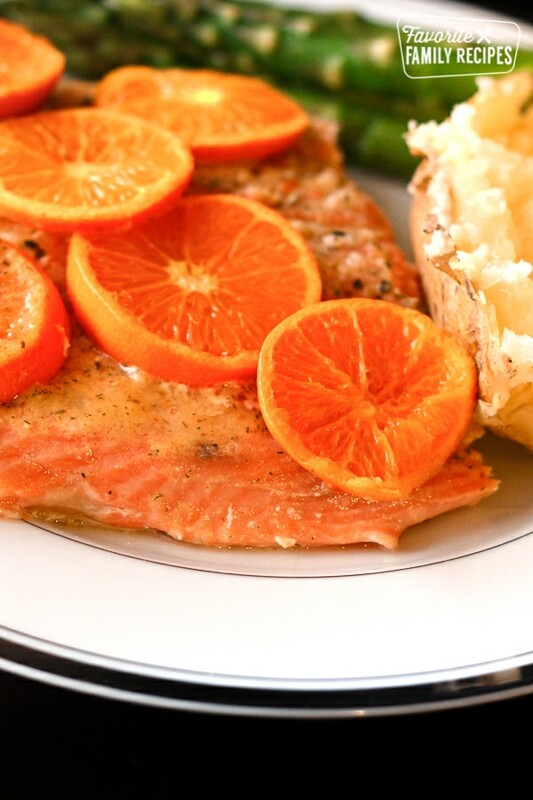 Fresh oranges give this Orange Grilled Salmon a citrusy taste and tender texture. The salmon is wrapped in foil and then grilled to hold in the juices. This is a delicious orange grilled salmon recipe that I got from Echo. Now that the weather is getting warmer all I want to do is cook out on the grill, this is a sweet tangy dish that even your kids will love. Remember when cooking salmon, to avoid it tasting “fishy” you want to cook it within a few days of buying it (I prefer getting it from Costco), and do not freeze it! Place salmon skin side down on a large piece of aluminum foil. Squeeze one orange over the top (if your oranges aren't very sweet, substitute this for 3/4 c. Simply Orange orange juice) then sprinkle generously with the brown sugar and salt. Cut the second orange into slices and layer over the top. Completely cover with the aluminum foil, fold and seal, then grill on medium heat until fully cooked. I made this salmon for Christmas Eve/Husband's birthday dinner. It was so good we had to make it again for our New Year's Seafood Extravaganza. Thanks for the recipe (and many others)!! that looks so tasty! i will be trying it this week. Why shouldn’t you freeze salmon? I always buy the frozen salmon from Costco. When you buy it fresh, then freeze it yourself, then thaw it, it has a much stronger odor and “fishy” taste. I disagree. I buy salmon from Costco, cut and vacuum seal immediately. It’s 12 or so meals for me and never tastes fishy. Keeps well this way in the freezer for months. Do you know about how long it cooks on the grill? We just tried this recipe tonight and it’s amazing! Best salmon we’ve had. Thank you for sharing! We LOVE it too! Thanks!